1) Entrants Must ONLY use samples that are in the sample pack provided below to produce a track using with the sequencer of their choice. 2) The track can be any style of music. 3) Their is no limit or minimum amount of samples used, as long as they are all from the pack. 4) Songs must be between 2.00 minutes - 6.00 minutes in playing time. 5) The use of VSTI Instruments, REAL instruments, Signal Generators, Software synth's / Drum machines or any Hardware (except your computer and a sampler) is completely forbidden. 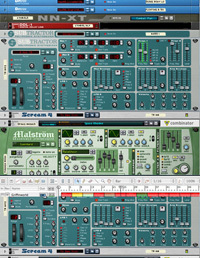 The use of any VST / DX effect plug in is allowed, as is the use of external effects hardware. 7) One entrant per alias, entrants can make multiple entries using different aliases. 8) Entrants must keep their track (apart from submitting by email) to themselves until voting begins.
. . . Be Creative. All entrys will be uploaded to the site. The judging criteria simple i.e. if people like it and think its good ( after all, its not ice skating ) then they will score high. . Depending on number of entrants forum members will vote for their favourite track and then a panel of judges pick from the top 5. ANYONE CAUGHT CHEATING, WILL BE DISQUALIFIED WITH NO APPEAL FOR RE-ENTRY! CHEATS WILL BE BLUDGONED TO DEATH BY BIG JIM HIMSELF. How to sumbit your track. 1) Once finished tracks should be encoded as 192kpbs MP3 format and put into a .zip or .rar file with screenshot and the composer�s details. 2) Zip files or a link to the file (if using a file hosting service like www.yousendit.com) should be sent to sh.production.comp@googlemail.com, feel free to send files to this address. To Enter your song into the competion, Send your completed song in mp3 format along with a �screen dump� / screen dumps, please put these files in a zip / rar archive. BIG UP THE PHONOFRANTIC FOR THIS GREAT IDEA! Please note: The samples are not royalty free so cannot be used for profit, or released in any way shape or form without permission from the original sources. All samples in the pack are for sole use in the competition and no other project or competition.